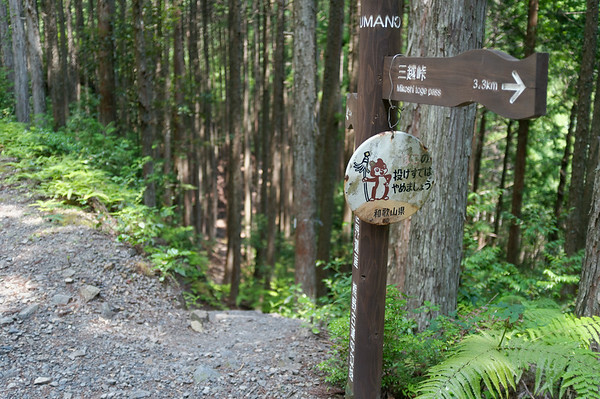 This was going to be the most challenging day of the Kumano Kodo trek as I needed to tackle 27km (ignore the fact that the GPS states 22km — not sure why it reports such a lower number) in distance and make sure I arrive on time for a bus that left at 16:58. Unfortunately, my body and mind was apparently so excited for this lengthy and challenging hike that it didn’t rest very well. Fortunately, breakfast at the Minshuku Chikatsuyu was very satisfying and had me up and running in no time. After breakfast, I packed up and wished the owner well. It was surprisingly hot at 7:00 in the morning that day. I was hoping that the morning would be overcast but alas, it was looking like a bold and hot sunny day. I wasn’t sure how quick a pace I could maintain so to ensure I would make it on time to certain “checkpoints” on the map I had picked up, I decided I would refrain from taking as many photographs when possible. 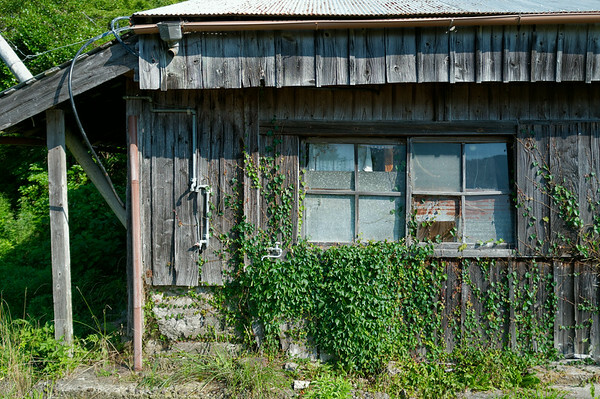 The owner of the Minshuku Chikatsuyu had shown me on the map the approximate time required to hike certain sections and I strived to meet those time frames wherever possible. It was a really great experience to have the opportunity to trek through these villages and towns. 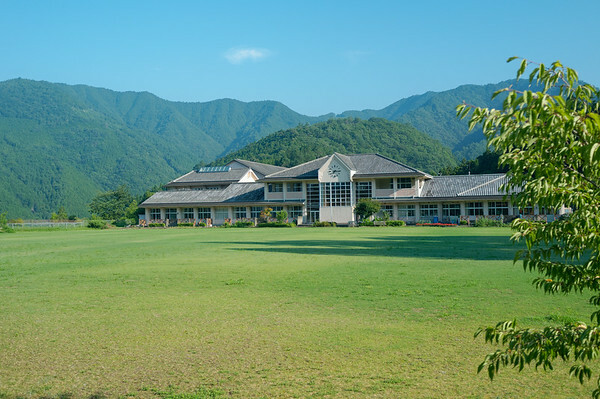 I never imagined the school grounds would be so impressive in the mountains and that I would encounter so many jizo statues along the road side. 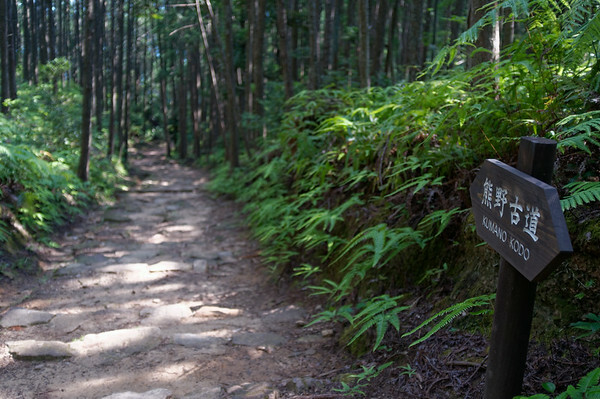 The pilgrimage trail would take me into a mix of road and wooded path. 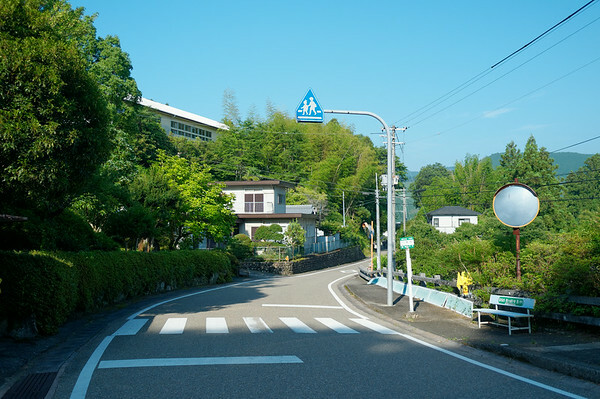 Everyone I encountered that morning greeted me with “Atsui desu ne?” — meaning, “hot isn’t it?” Aside from “konnichiwa”, speaking about the heat or cold seemed to be a common response … I guess it isn’t too different from talking about the weather here in North America! 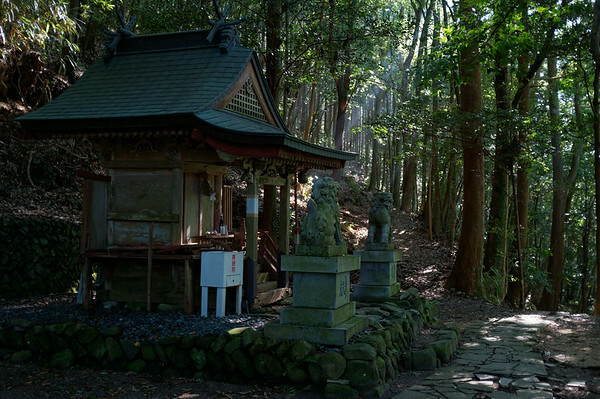 I was making good time that morning and eventually found myself hiking up to various shrines. 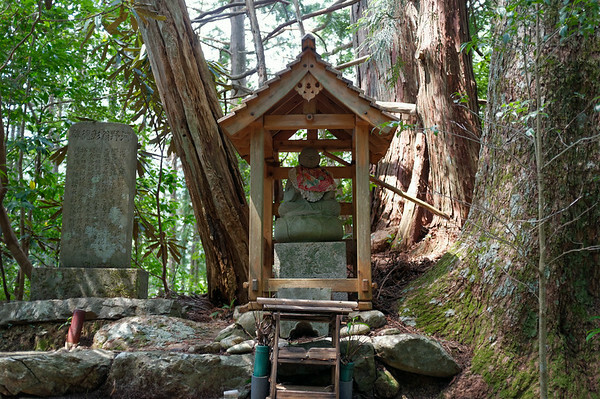 These shrines would often be located off the side of the road but would require one to hike up a steep hillside trail in order to reach these statues or shrines. 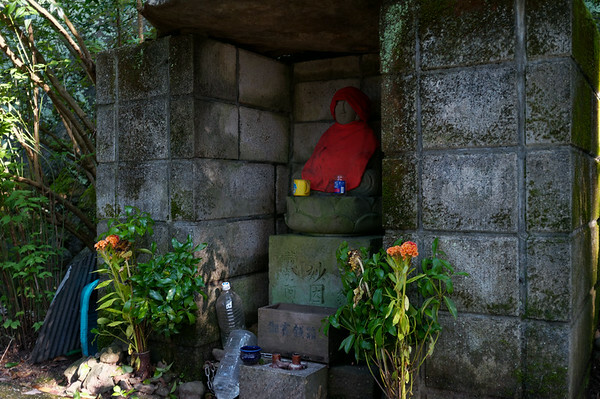 As much as I enjoyed the wondrous sight of these shrines in a remote or hidden part of the mountain at times, they were hindering my ability to cover a certain distance within the times that I had originally set out. It pained me to sometimes feel like I had to choose between having the opportunity to visit the shrine or cover the distance in the time. 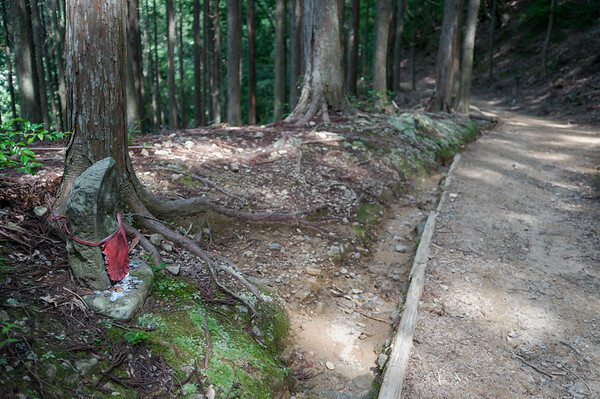 I think I managed to visit majority of the shrines or statues along the way. I say most because I may have passed some without noticing the signage. After passing through some more common country roads (although there was barely any traffic), I found myself confronted with a detour. 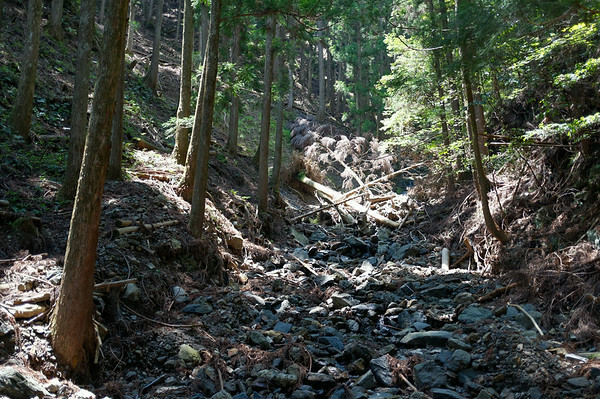 Apparently a recent typhoon had severely damaged a part of the original Kumano Kodo trail so a detour was created. I anticipated at least three major ascents on the trail and this was the first major ascent today. Somehow, I have a feeling that the original trail may not have been as tough as the detour but nonetheless after a lot of huffing and puffing up a steep trail, I finally reached the forest and the temperature immediately felt a few degrees cooler within the wooded area. Almost like air conditioning! The wooded area though cooler made it easier to hike. Interestingly enough, I would hear a chainsaw every so often and would stumble upon construction sights. I’m not sure if what I came across were lumber crews but they seemed to be using some form of selective harvesting approach with regards to the forest. 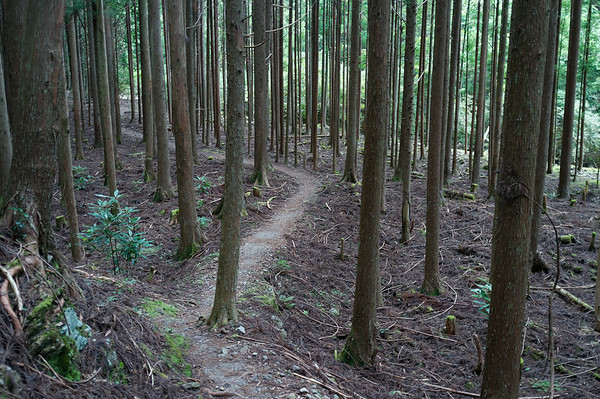 Perhaps they were trying to maintain a very manicured appearance to the trail and its surrounding vicinity? 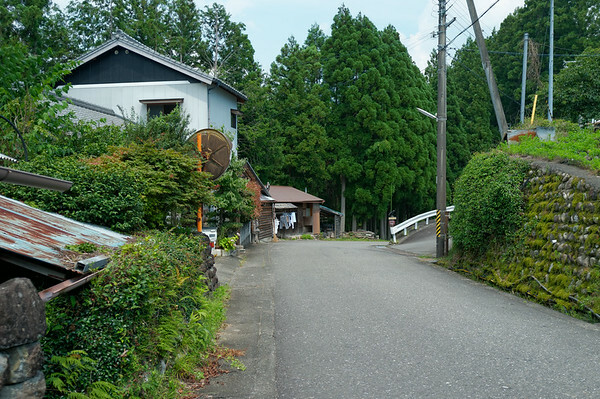 One of the additional challenges on this day of the Kumano Kodo trek was that I forgot to ask the owner of the minshuku I stayed at to prepare a bento box lunch. This meant I had nearly no food for much of the 27km. In fact, if it weren’t for the fact that I had pocketed a Cliff Bar in my backpack before I left for Japan and had left a chicha morada candy from Peru in one of my pockets, I would have no food whatsoever! Silly mistake that I was kicking myself for what could I do? I was still on schedule so I decided to take a much needed break and thankfully, also found a working faucet to refill my water bladder and bottle — which was much needed! I was surprised to find so many faucets that did not work. 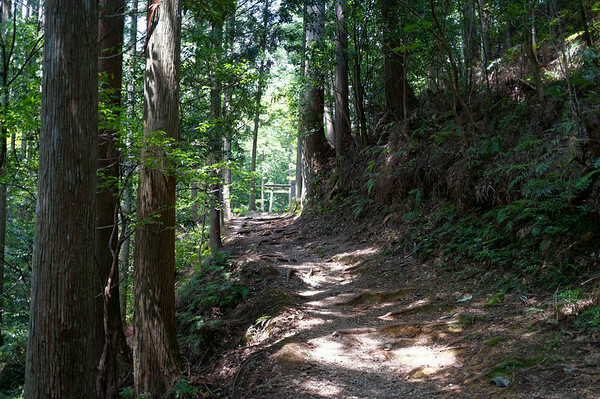 Keep that in mind if you do hike the Kumano Kodo, particularly in the summer. Despite carrying at least 3 litres of water with me, my rate of water consumption was likely pretty high. The beautiful aspect of this long day was the wide range and diversity of things that I had the opportunity to experience and discover. 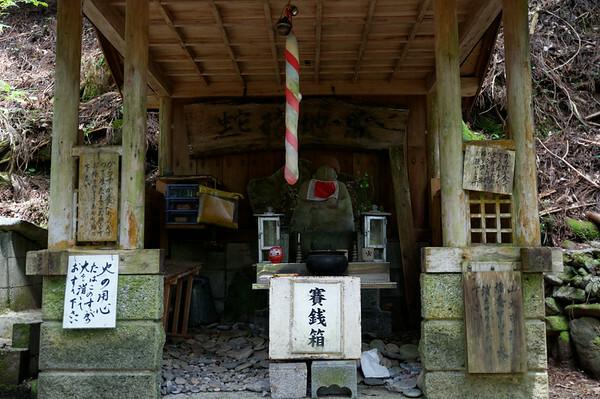 I really enjoyed the various shrines (oji’s) that I would encounter along the way but more so the unexpected abandoned teahouses or structures. 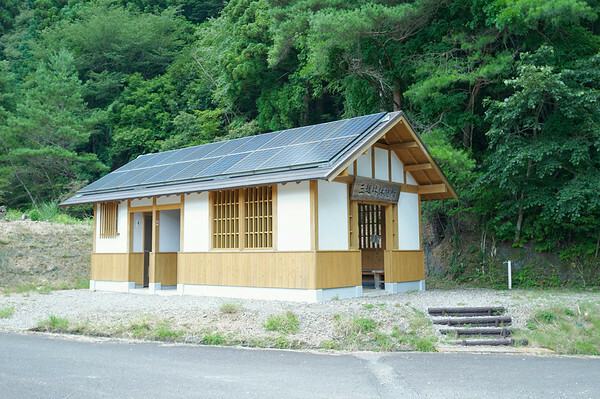 Considering how helpful some refreshments would be, I actually wish that some of these teahouses were still operating since they’d likely make for quite an enjoyable rest stop in the middle of the trail. Once I finally made two-thirds of the way, I did a little celebratory jig and enjoyed my time exploring and examining Hosshinmon-oji. 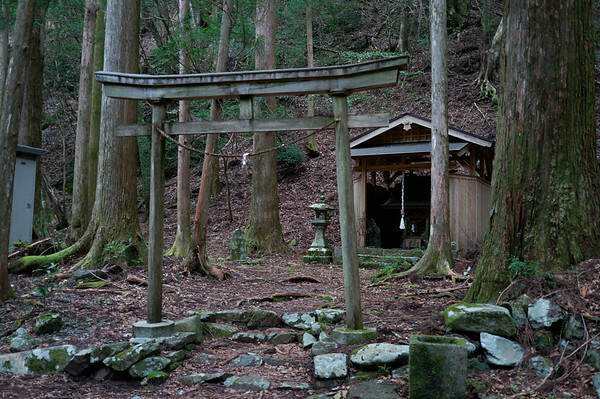 I was ahead of schedule and the uphill climb towards this shrine was worth the effort. 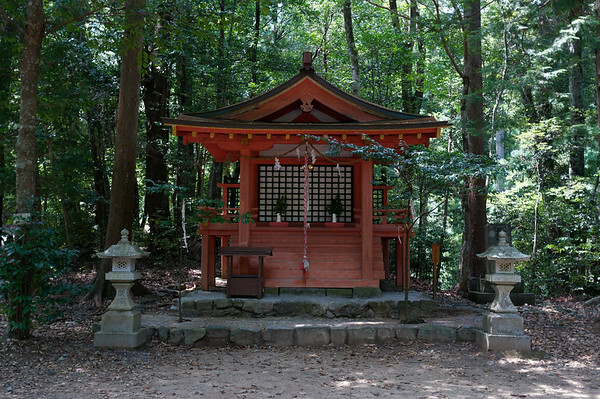 Apparently this shrine is considered the entrance to a sacred area called Nachi Hongu Taisha, and Hosshin means “aspiration to enlightenment”. I was definitely feeling drained from aggressively pursuing this distance with such a pace — probably paying for it at this point. Fortunately, the trail descended down the road and made its way past a rest area. The rest areas are always in such well-kept condition so at this point — considering that I was ahead of schedule — I felt it worth the while to stop for a bit and even treat myself to a nice cold drink. This time instead of tea, I decided to grab a bottle of Pocari Sweat. I’m not sure why anyone would refer to a drink as sweat but it is pretty much an energy drink similar to Gatorade that is found in most of North America. One thing that puzzled me is why there were never any vending machines that dispensed food. 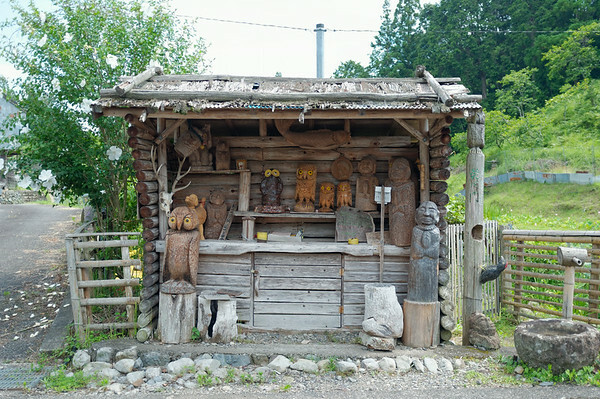 After passing through a tiny hamlet and taking a brief stop to look over some nifty-looking sculptures, I continued onwards. The temperature was at its peak by this point and I was attempting to maintain a good pace by being more selective with what I was going to photograph. This was pretty challenging because the trail itself is very pretty and one could leisurely stroll through and spend an endless amount of time with all the photo opportunities. Unfortunately, despite the fact that I had overcome the three major ascents on this part of the trail, there were still quite a few smaller uphill challenges to tackle. If it weren’t for my trekking poles, my legs would have been pretty numb! The other challenging aspect was the fact that once I was out of the woods, I was completely exposed to the sun (I’m glad I didn’t get sunburnt!). In some cases, I found myself trekking across and over vast fields. I kept coming upon ascent after ascent which was getting to be extremely tiring — particularly after not having any lunch. I was really itching for some carbs! 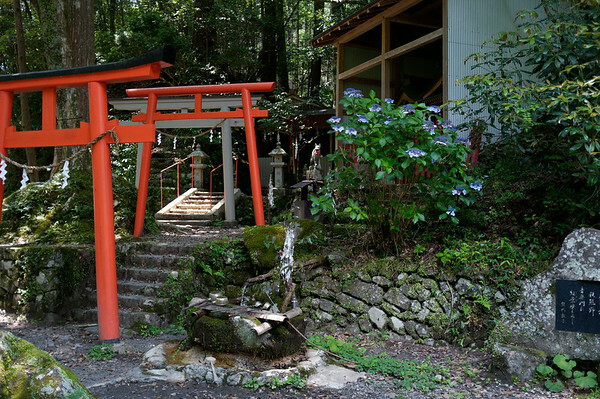 Soon after making my way past a small residential community and a fascinating cemetery, I finally made a lengthy but gradual descent towards Kumano Hongu Taisha on a very beautiful stone path. Alas, I think I was so focused on making it to the bus on time that I missed out on a side trail that would have taken me to a lookout point. This path eventually led me to an amusing sight. 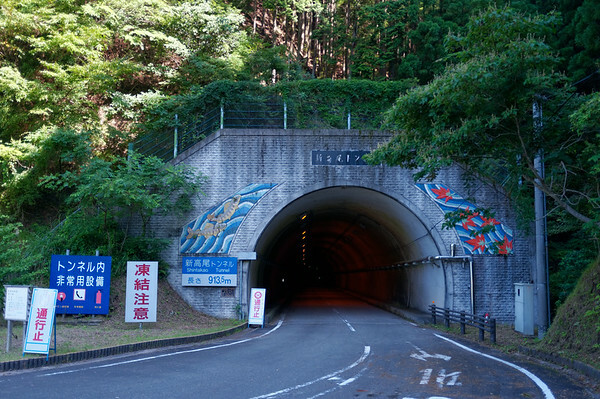 An entrance into Kumano Hongu Taisha that was meant for cars. 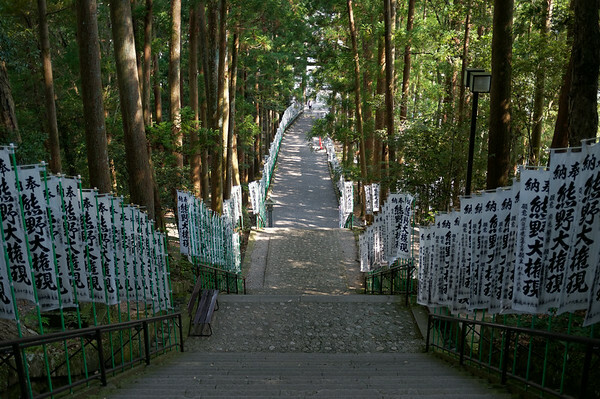 Pedestrian traffic — ironically — was required to find alternative paths around all the car traffic, rather than the shrine entrance itself. It was a very busy place! 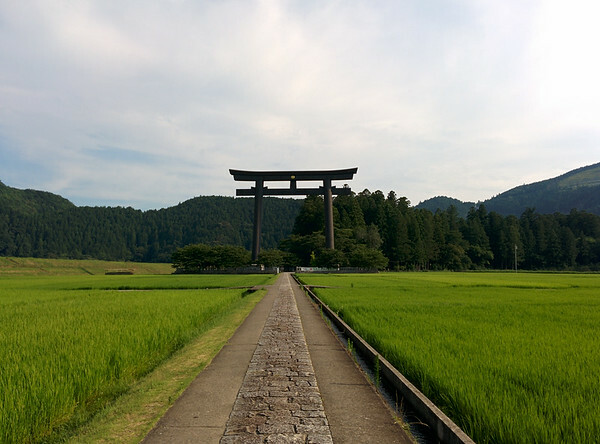 The temple and grand shrine were quite a sight and I was felt both relieved and a sense of accomplishment for completing the 27km hike on time. In fact, I arrived around 15:30 — significantly earlier than I anticipated! 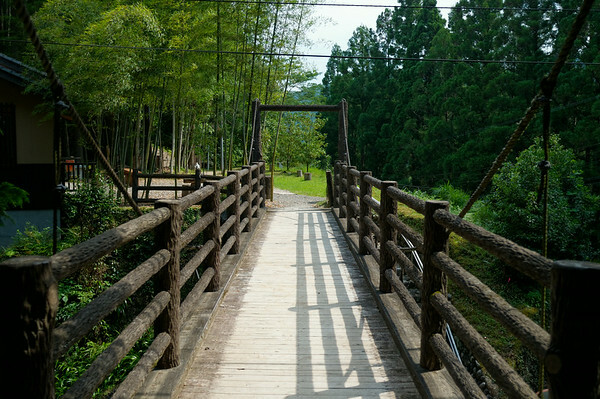 I took the extra time to wander around the Kumano Hongu Taisha site and enjoy the atmosphere. 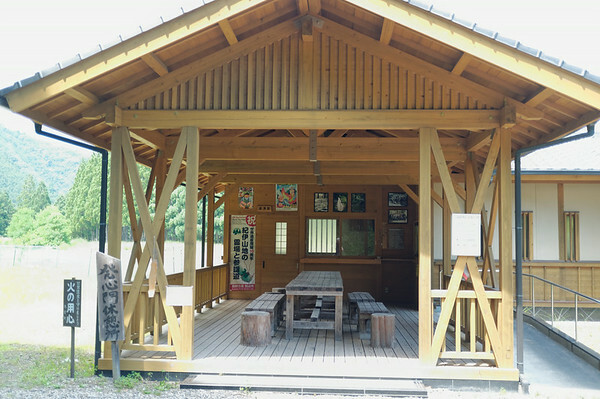 There was even a visitors centre that was in the midst of construction. Though I was tempted to purchase a souvenir or two, I was so tired that I sought out a place to sit down and proceeded to walk down a long set of stairs. 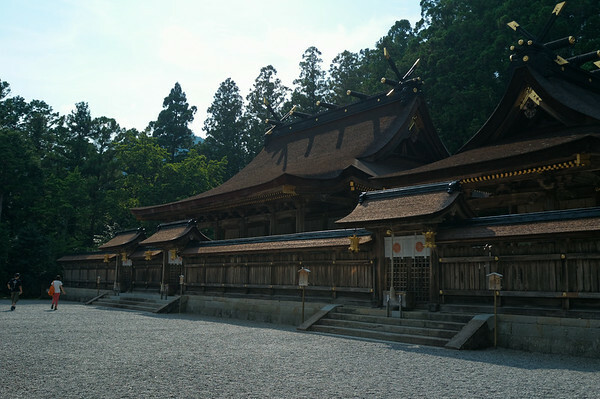 The Kumano Hongu Taisha Grand Shrine is apparently the centre of the entire Kumano Shugendo faith. 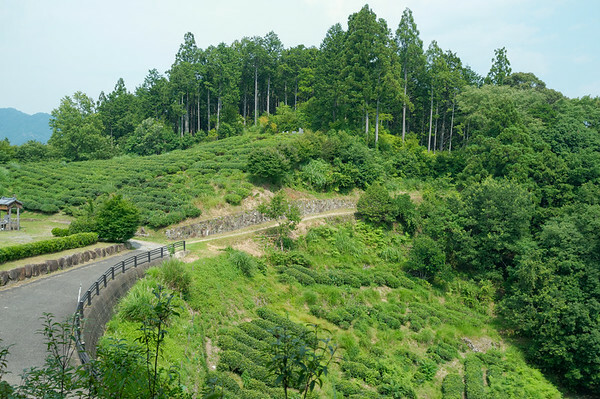 From what I understood, there were three grand shrines and the journey for most pilgrims — which seemed quite elaborate, from ferrying across the river with small boats to trekking over mountains — would start from and end at this grand shrine. Sounds like quite the pilgrimage. I think I’m quite relieved at this point that I didn’t have to start from this grand shrine and return. 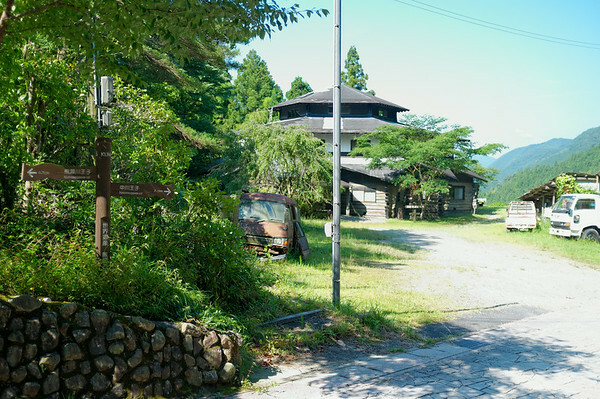 Since I had arrived so much earlier than the bus, I ended up crossing the street and visiting the large Kumano Kodo Visitor Centre. Not only was it perfect for history buffs (and those who weren’t literate in Japanese), it had air conditioning! Even so, I could only bear so much more walking around inside a visitor centre with what seemed by this point as a heavy pack. 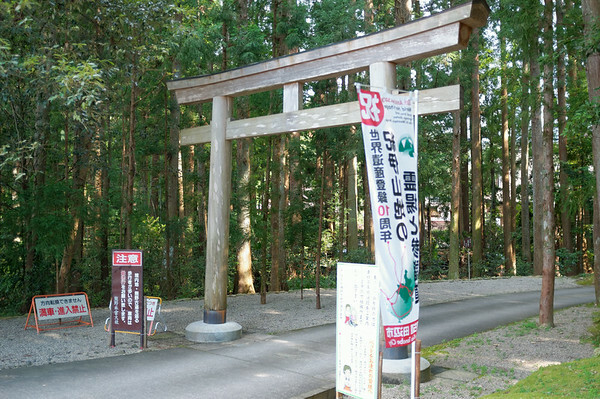 I noticed a lot of signs pointing to Oyunohara (a huge shrine gate). 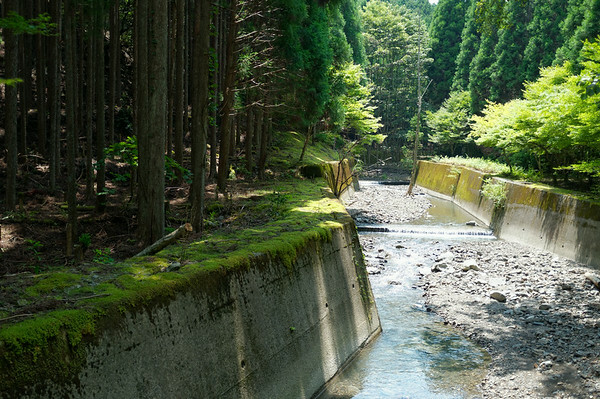 Its location apparently was the original location for the Grand Shrine. I was hoping to see to Steven and Michelle, a couple from New York along the way on this long hike but at no point did I encounter them and even when I arrived at the bus stop, there was no sign of them. 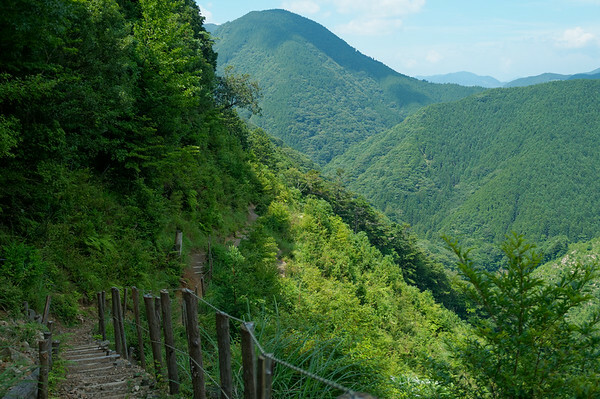 It was definitely a tough hike today and I hope they managed well though I wish I had the opportunity to wish them well as they were to leave Japan for their next destination soon while I would be continuing on the Kumano Kodo trail. While waiting for the bus, a number of British tourists noticed I had a water bladder and were very vocally curious about it. The amusing thing is that they all thought that I was Japanese (which was quite common during my experience), even the owner from the Minshuku Chikatsuyu mentioned that he couldn’t tell me apart from local Japanese. I can only say that it has its pros and cons. 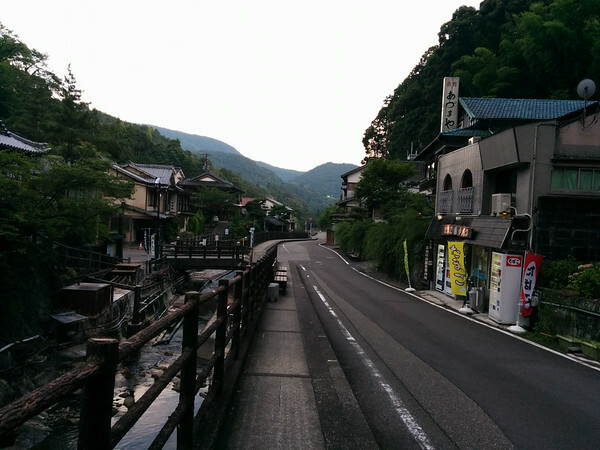 Soon the bus arrived and I hopped on board with a sigh of relief as it took me to the little village of Yunomine Onsen, made up of many inns with access to the hot springs in the area. 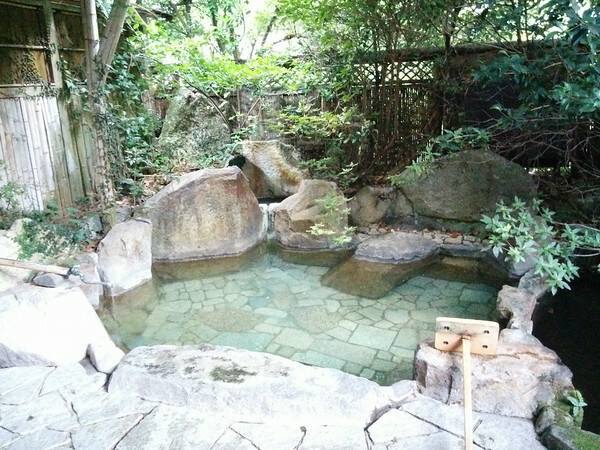 This time, I had the fine opportunity to stay at the Yoshinoya Ryokan where they even had a private outdoor onsen (with crazy hot water — I had to keep a cold water tap on to lower the temperature). 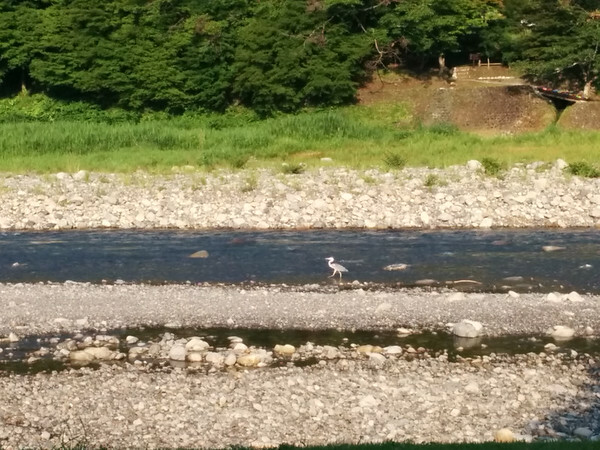 It was a beautiful setting nonetheless, there was even a pond next to the onsen itself and I spotted fish and a couple of toads or frogs. 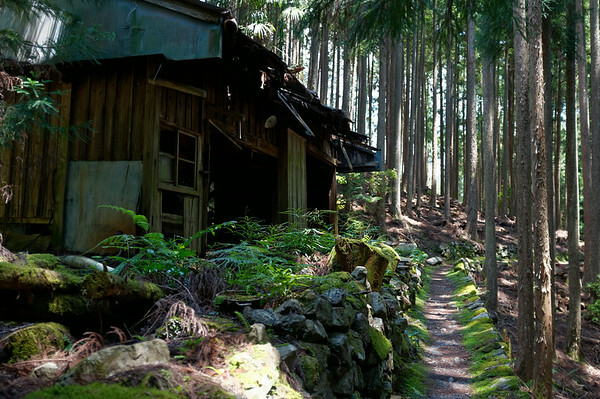 In the ryokan, there was only one other couple and myself who were staying that night. They were serving dinner a little slow for me so I mistakenly took leave from the dining room a little too soon. My hosts ended up chasing me down because I had missed out on the dessert (fruit) that they were serving and brought it to my room. I was definitely going to rest well tonight with all the distance I had covered and all the energy I had used up. Still, it was rewarding to achieve what I was initially unsure of my own ability to tackle. 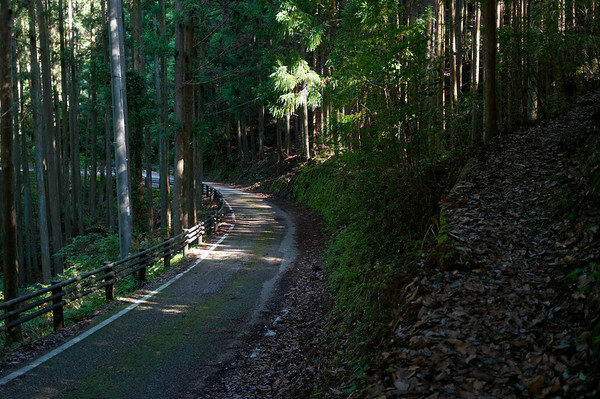 One more full day of the Kumano Kodo to go!